Bright Spacious Well Looked After! Just Over A Year New! 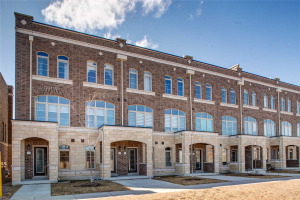 Extra Bright 2 + 1 Bedrooms Townhome, With Open Concept Kitchen Which Over Looks Living And Dining Room With Two Walkouts To Full Size Rear Patio. Private Roof Top Terrace With Gas Line For Bbq. 10 Ft Ceilings On The Main Level. Up Graded Laminate Flooring Throughout. Upgraded Kitchen Cabinets And Island, Upgraded Range Hood. Close To Schools, Parks, Public Transit. Fridge With Water Line, Stove, Washer, Dryer ,B/I Dishwasher, B/I Microwave . All Elf's, All Window Coverings. Hvac/Hwt Rental Fee $89 Per Month.